Student membership is available to full time students and apprentices of any age for a maximum of 3 years. It is also open to part-time students whose course of study has a minimum 25 days of contact time or equivalent guided learning hours (if undertaking a course via distance learning). Student membership is FREE as of 1st January 2018 and will last for the duration of your current course of study. 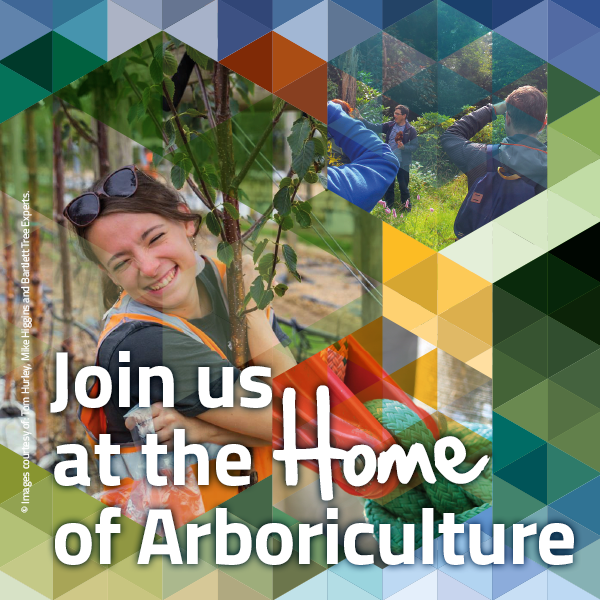 Online access to our quarterly ARB Magazine – Our official member publication, featuring the latest in cross industry news, study, research and collaboration, the magazine will keep students informed in the world of amenity tree care along with our other membership publications. Online access to our Arboricultural Journal – the Arboricultural Association Journal is a valuable resource to practicing and studying arborists. As a student member you get online access to the full library of back issues and will receive copies of the latest issues throughout the year. AA Training Course Discounts – Student members are all entitled to make the most of the varied course content on offer at significantly discounted member rates. We offer courses on everything from Climate Change and Subsidence, to Professional Tree Survey and Inspection. Free 1-year ISA membership – Student grade members of the AA are entitled to receive free student membership of the ISA for one year – a fantastic way to sample their publications and online provision! Student membership does not count towards progression through the membership grades, but gives you access to essential career progression resources at a significantly discounted rate and provides a valuable tool in advancing and increasing your Arboricultural knowledge and awareness. The grade structure is linked to the UK’s Qualifications and Credit Framework so you can join or move up to a grade appropriate to your qualifications and/or experience as your career develops. Other than proof Student ID and following our professional code of conduct, there are no obligations, but it is good practice to keep an account and take advantage of all career learning and development opportunities. You can keep track of your continuous professional development or ‘CPD’ using your CPD form. This will help you maintain and develop your professional skills throughout your working life and covers a multitude of training and development opportunities; from formal seminars and training courses to in-house, informal training and self-guided study such as reading. CPD will also be useful if you are looking to progress through the grades as your career in Arboriculture advances and you gain access to the increasing benefits of membership of the association. After your student membership application is confirmed you’ll receive your welcome letter which will include your Membership Card for the year. AA Membership has many benefits including professional recognition and status. Customers will see membership of a professional association as a demonstration of your commitment to standards, skills and knowledge. Branches, networking and contacts – By joining you automatically become a member of your local branch. Branches are a way of interacting with industry professionals and arborists near to you and they also hold meetings and events throughout the year and have their own Annual General Meeting. In addition to the range of benefits and discounts available to you as a member, your membership will enable your personal development and the progression of a thriving and prosperous industry. Utility Arboriculture Group (UAG): All our members are also entitled to receive free ‘virtual UAG membership’. Virtual UAG members are kept up to date with the latest industry standards, minutes. Members can also choose ‘full UAG membership’. The Utility Arboriculture Group aim to raise consistency in the level and standards of both tree work and safety nationwide, and its members will have access to minutes and the opportunity to be part of consultation on significant issues. Members will be kept informed on the latest significant issues, health and safety bulletins and latest standards and be able to vote on elections to the UAG core group. If you have a passion and an interest in raising and advancing tree work standards you can even join the UAG Core group or Arborists Working Group and Consultants Working Group, by nomination, to help progress and steer their initiatives and work. Student membership does not count toward grade progression.